Experience the best of both worlds! Spend time wake a great opportunity to indulge yourself in a Romantic weekend getaway! Experience Jerusalem’s top religious and historical landmarks. Bathe in the healing powers of the Dead Sea, and visit Masada. With quick flights from Europe, you’ll be here in no time! Book today. A memorable trip to the Church of the Holy Sepulcher, Via Dolorosa and other Christian landmarks. 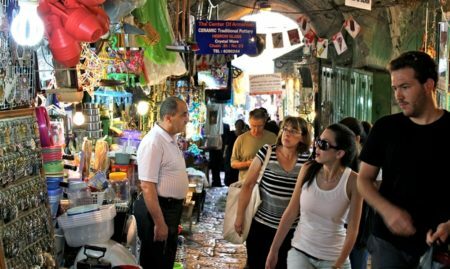 Spend the day exploring all that the scents, flavors, and sounds that the Mahne Yehuda Market has to offer. After sundown explore the Mamilla open market stores and restaurants for dinner or we recommend making reservations for dinner at Mahne Yehuda Restaurant. (available for max 12 pax). Wake up in Jerusalem to see all the highlights of Jerusalem both Old and New. Your tour will start with a visit to Mount Olives. 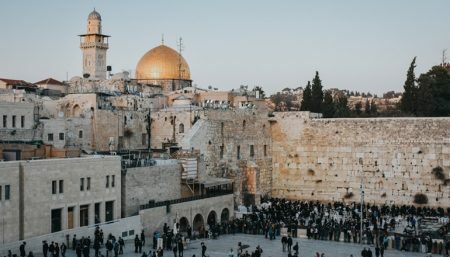 You will travel through the Old City of Jerusalem where we will see the Byzantine Cardo, the Kotel, the Western Wall, the Via Dolorosa, the Stations of the Cross and the Church of the Holy Sepulcher. From there you will continue to a visit at the Holocaust Museum Yad-Vashem. Tour ends in Jerusalem (Tour is $71 OR take a private tour for $250 per group). Go back to the hotel and freshen up before you go out for dinner and to see the Night Spectacular Sound and Light Show. Visit Masada and spend the day bathing in the magical mud of the Dead Sea. (Optional Private Tour for $750 per group of up to 6 participants OR go on a group Tour for $105 per person). Freshen up at hotel in Jerusalem. Friday / Sabbath dinner at your hotel in Jerusalem. Depending on when your return flights are, if you have time, we recommend exploring activity options in Jerusalem. Airport Transfer and flight back home until next time! When you book with iTravelJerusalem you’ll receive special insights to fun events, activities, restaurants, and more all happening in Jerusalem. iTravelJerusalem can offer customized tours based on your budget and get you the best deal around! Please note: if you book a group tour all admission fees are included. Please note: if you book a private tour, entrance fees to sites are not included. 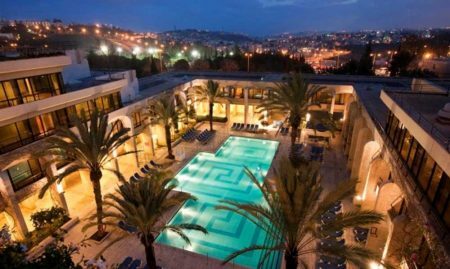 iTravelJerusalem can arrange transportation services to hotels, sites, activities and more!